Nestled within the Yarnaz Valley just 10 kilometres (6 mi) west of Turpan, the Jiaohe Ruins will transport you back to the heart of the Silk Road. The history of this ancient city stretches back over some 2,300 years, making it one of the oldest earthen cities still in existence, and it was unsurprisingly incorporated into the Silk Road UNESCO World Heritage Site in 2014. After all, at the grand old age of 2,300, you’d expect to finally be able to retire! 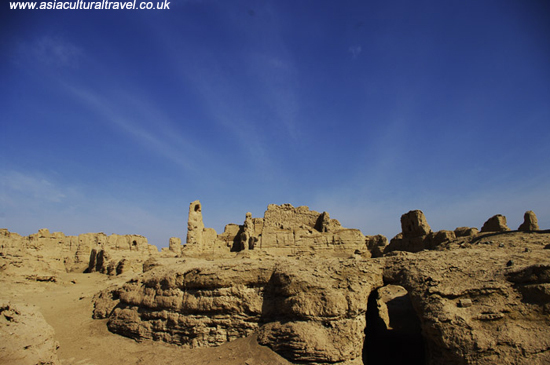 It was once the capital of the Jushi or Cheshi Kingdom, which ruled the area throughout most of the Han Dynasty (206 BC–220 AD), but the city was captured by the Han court during the 1st century BC. 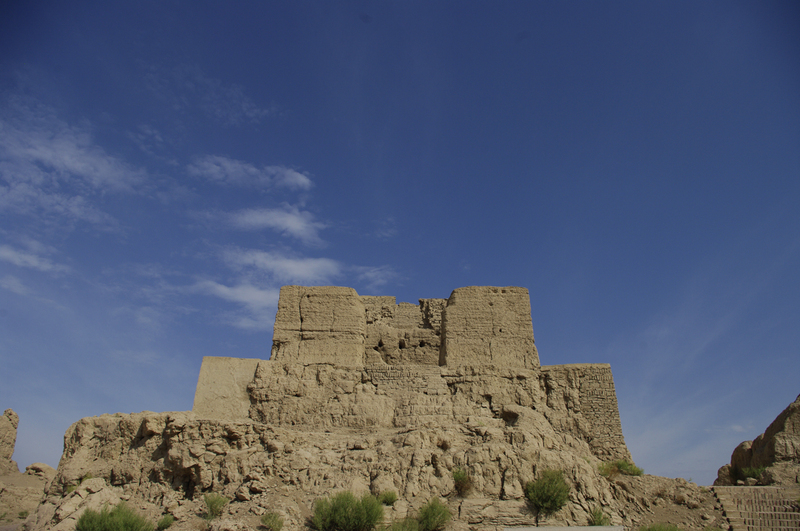 It soon became a focal trade hub along the Silk Road and, as an oasis town, it was considered invaluable. The entire region, including Jiaohe, was annexed by the Gaochang Kingdom (531-640) during the 6th century but returned to Chinese control in 640, during the Tang Dynasty (618-907), when it was conquered by Emperor Taizong. It was during this period that the city flourished as a centre of trade between China and Central Asia. 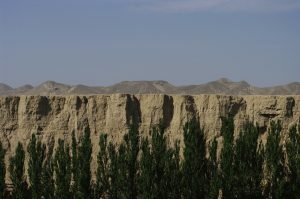 At the beginning of the 9th century, the area came under the control of the Uyghur people and was part of a kingdom known as the Uyghur Khaganate (744–840), until their territory was eventually conquered by the Kyrgyz people in 840. 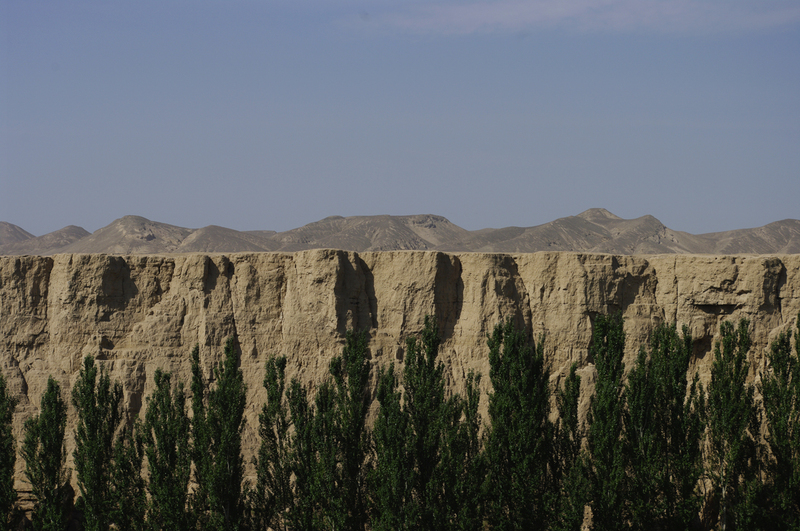 Though the city continued to thrive under Uyghur and Kyrgyz rule, it was destroyed during warfare towards the end of the 13th century when the Mongolian warlord Kaidu rebelled against his cousin Kublai Khan, the grandson of Genghis Khan and the founder of the Yuan Dynasty (1271-1368). It remained a ghost town for many hundreds of years, until it was finally rediscovered and partially excavated during the 1950s. Since then, Jiaohe has gone from deserted spectre to adored superstar! The city was built on a large islet nestled between two deep river valleys and was thus named Jiaohe, which translates to mean “where two rivers meet”. Yarkhoto, the alternative name for the city, may be derived from the Turkic word “yar”, meaning “ravine”, and the Mongolian word “khoto”, meaning “town”. The steep cliffs on all sides tower in at over 30 metres (98 ft.) in height and once served as a natural protective barrier, so city walls were never constructed. There were originally only two gates leading into the city, but the South Gate has since vanished and only fragments of the East Gate remain. The city is separated into three districts: eastern, western, and northern. The eastern and western districts were residential, with the east largely inhabited by aristocrats and the west belonging mainly to commoners. The northern district was reserved entirely for religious sites, such as Buddhist temples and stupas. Towards the centre of the city, there are a number of governmental buildings that have been exceptionally well-preserved. According to Tang imperial records, in its heyday the city was home to 6,500 residents, 700 households, and 865 soldiers, and many of its surviving buildings date back to the Tang Dynasty. The doors and windows of the buildings do not face the street, which is a peculiarity of Tang-style architecture, and several of the courtyards have been physically dug out from the earth like a pit, which is a rare phenomenon found mainly in northwest China. All of the buildings are made from packed-earth and they have managed to remain in such good condition thanks to the extremely dry climate in the region. A stroll down Jiaohe’s central avenue rewards visitors with the greatest views, as it cuts through the city and provides access to all three districts. At the end, there is a stunning Buddhist temple known as Jiaohe Temple or the Great Monastery and, in the northernmost part of the city, there are a group of 101 stupas that date back to between the 5th and 7th centuries, known as Stupa Grove. 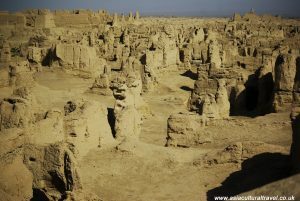 Many of the relics that were excavated from the city are now housed in either the Turpan Museum in Turpan or the Xinjiang Museum in Ürümqi. However, near the ruins there is a museum dedicated to the Cheshi (Jushi) people, who were Jiaohe’s original inhabitants. Bizarrely these people were of Caucasian descent and had light hair and blue eyes, unlike the Han and Uyghur ethnic groups that populate the area now. They have enjoyed some fame recently as evidence suggests they were probably the first cultivators of cannabis (marijuana). We’re sure this discovery must have given the researchers a real high!